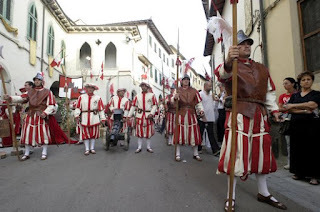 The Palio del Cerro is a contest that takes place between the four contrade (quarters) of Cerreto Guidi, and in the past is known to have been held on the first Sunday of September during the Feast of Santa Liberata. The teams compete in a tug of war; a race on trappoli (small brick-shaped wooden blocks); a race in barrels (bigonce), a hoop-throwing competition, for women and girls only; and a cross-bow contest. 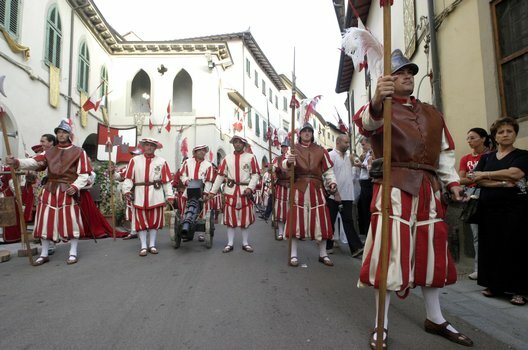 The Palio del Cerro is now held some time around the end of August and the beginning of September, and involves the entire community, who gather in the large square in front of the large staircase or rampe leading up to the Villa Medicea.